Robots and jobs. Robots and Steve Jobs. Robots and Steve Cousins. The cousins of all your favorite robots. You can check out the full program for Robo Madness West here. As in recent years, the agenda will include spotlight talks, spirited panels and chats, and plenty of networking time as our speakers and attendees map out the future of robotics from commercial, investor, and startup points of view. As you can see, the sectors represented are quite broad. —Jim McCollum from Restoration Robotics will talk about lessons from building his company in the hair-transplant and medical sector. Restoration has raised more than $100 million in venture funding since its inception. —Roger Hine from Liquid Robotics will talk about solving critical problems with ocean robots. —Rich Mahoney of SRI International will give his unique perspective on recent advances in robotics and the future of the industry. —We’ll have startup and innovation panels featuring folks like Melonee Wise of Fetch Robotics, David Cann of Double Robotics, Alex Vardakostas from Momentum Machines, Bilal Zuberi from Lux Capital, Ryan Kuder from the Qualcomm Robotics Accelerator/Techstars, and Kyle Vogt from Cruise Automation. —Jacob Rosen from Applied Dexterity and UCLA will present a special demo of the Raven tele-surgical robot. We’ll also be giving away three Roombas to lucky audience members, courtesy of iRobot. But you have to be there to win—tickets have gone fast, but you can still grab one here. 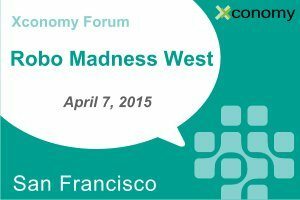 Xconomy and SRI look forward to seeing you on April 7.